Dimensions 1.05 by 6.42 by 9.53 in. Amazon.com description: Product Description: The bestselling author of The Martian returns with an irresistible new near-future thrillerâa heist story set on the moon. Not crazy, eccentric-billionaire rich, like many of the visitors to her hometown of Artemis, humanityâs first and only lunar colony. Just rich enough to move out of her coffin-sized apartment and eat something better than flavored algae. Rich enough to pay off a debt sheâs owed for a long time. So when a chance at a huge score finally comes her way, Jazz canât say no. Sure, it requires her to graduate from small-time smuggler to full-on criminal mastermind. And it calls for a particular combination of cunning, technical skills, and large explosionsânot to mention sheer brazen swagger. But Jazz has never run into a challenge her intellect canât handle, and she figures sheâs got the âswaggerâ part down. The trouble is, engineering the perfect crime is just the start of Jazzâs problems. Because her little heist is about to land her in the middle of a conspiracy for control of Artemis itself. Trapped between competing forces, pursued by a killer and the law alike, even Jazz has to admit sheâs in way over her head. Sheâll have to hatch a truly spectacular scheme to have a chance at staying alive and saving her city. 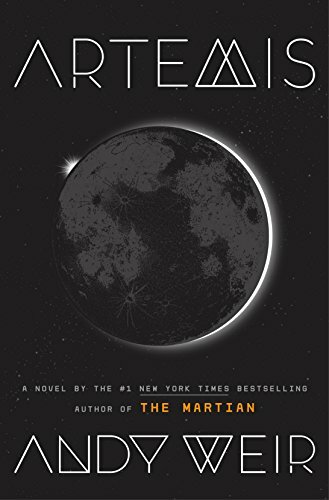 Propelled by its heroineâs wisecracking voice, set in a city thatâs at once stunningly imagined and intimately familiar, and brimming over with clever problem-solving and heist-y fun, Artemis is another irresistible brew of science, suspense, and humor from #1 bestselling author Andy Weir.